With letter characters larger than usual and command keys in a larger bolder font, these high-contrast keys can really help those who have trouble seeing keyboards. Perfect for schools, special needs departments and libraries, as well as companies, organizations and government offices which need to have Assistive Technology adaptations available. --- -- Keys with letter characters larger than usual and command keys in a larger bolder font, these high-contrast keys can really help those who have trouble seeing keyboards. Perfect for schools, special needs departments and libraries, as well as companies. Big Keys Keyboard has been designed specifically for those with conditions that cause visual impairment or low vision, such as macular degeneration, glaucoma, diabetic retinopathy, and cataracts. These large print, big key keyboards are perfect for anyone who has a hard time seeing the existing commands on their keyboards. With a bigger and bolder black typeface on vividly bright yellow keys, the keys are easier to see. Additional keys (hot keys) have been added to the keyboard to allow for easier access to commonly used commands, such as searching and accessing email and the Internet and energy saving commands: wake and sleep, when you need to leave your computer on, but won't be using it. These big, bold keys will have you using the computer, with more accurate keystrokes for a more enjoyable time. English Large Print keyboard provides superior comfort without forcing you to relearn how to type; The Keys-U-See USB big print computer keyboard is designed for those who have a hard time seeing the Keys. 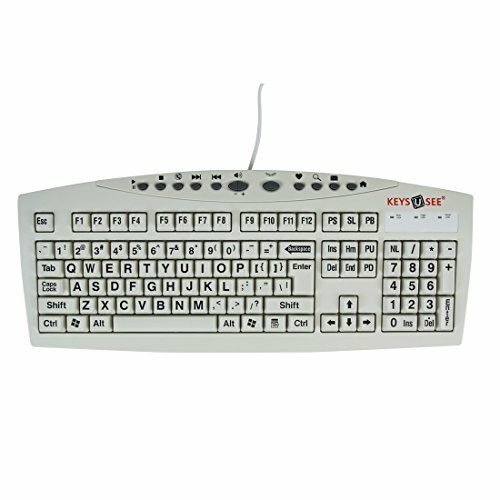 It is a full size enhanced 104 key keyboard with standard US English keyboard layout printed in big and vivid letters. The keyboard is manufactured with high quality membrane switches designed to withstand over 10 million strokes or a lifetime to some. This Keys-U-See Large Print Keyboard has been a designed specifically for those with conditions that cause visual impairment or low vision, such as macular degeneration, glaucoma, diabetic retinopathy, and cataracts.